In Scotland we use about 200 million disposable coffee cups every year, but that’s ok we can just recycle them can’t we? Actually no! 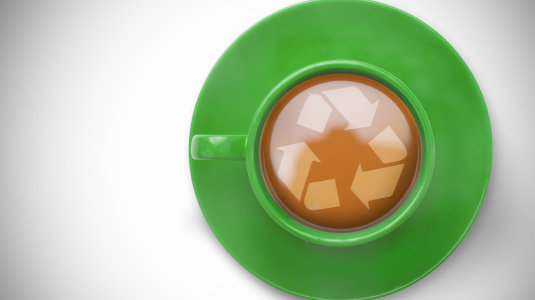 Find out why reusable coffee cups are flying off the shelves and into SFC. Never before have we had such an awareness of what we are doing to the planet. And never before have we had the power to do something about it. Surely we have a responsibility to care for our blue planet. A Python-esque group-nodding comes to mind: Care? Yes yes, we must care! Mmm, how awful, the poor planet! So here is a question: How is it that in an organisation like ours which is continually working on improving its own ecological footprint, invests time and effort into collating a Carbon Management Plan, an organisation who actually has its own Climate Change team – how is it that despite of all this, we still go through as many disposable coffee cups as we do on a daily basis? The waterproof polyethylene lining of these cups is very difficult to separate from the majority of the paper cup (you should try this sometime), therefore making it difficult to put the paper back into recycling. Recycling the cups therefore requires a specialist facility of which there are only 2 in the UK (neither of which are in Scotland). It is estimated that in Scotland we use roughly 200 million DCCs every year (the whole of the UK uses 2.5 billion! ), but even at that, there is insufficient supply to justify a specialist recycling plant in Scotland. Yes, 200 million sounds like a lot, but they would all need to be consolidated into one area, which would involve enormous logistical efforts in transport. Recycling DCCs over great distance simply is not economical, so the sad reality is that most of our coffee cup waste ends up in landfill or incineration. At this point, anyone should surely be outraged by the amount of avoidable waste a lot of us contribute to. Shouldn’t we? Biodegradable cups: A good idea in principal, but not in practice. What they really are is compostable cups, and for this kind of cup to break down properly, it would need to go to a composting facility. If anything goes wrong on the way to such a facility, these cups too will go to landfill or incineration. Would the person holding the cup recognise that it is compostable? Would they seek out the correct bin? Does the waste contractor have the facilities to correctly treat these cups? If a machine is sorting the waste, it will not be able to tell the difference between a compostable and a non-compostable cup, and during manual sorting this could equally go wrong. What is important to recognise is that recycling DCCs, even if it happened half as often as we would hope, would still only lessen the impact of their lifecycle rather than solve the problem. So here’s a real alternative: Reusable cups (aka Keep Cups). Available in metal, glass, bamboo fibre and god-knows-whatever-else, they can be used over and over again. A small number of SFC staff have already made the switch so I am calling on this organisation to do more and lead by example! Seeing disposable coffee cups in our office should be as outdated as walking in with a new plastic bag every day which gets disposed of after a single use. We can do better than that and we should let it show! If we all started making a small effort to eliminate even a little bit of waste, there would be a profound impact. How about we see how far we can go?